SEJONG – With the 2018 GDP growth rate estimated to be stuck at about 2.7 percent, concerns and uncertainty are growing among middle-aged salaried employees. Weakening profitability and lackluster business confidence for the coming months have led more enterprises to cut their payrolls. Over the past decade or more, companies’ main solution for difficulties has been to reduce costs through voluntary redundancy programs. Early retirees are usually paid a lump sum in addition to statutory severance pay. 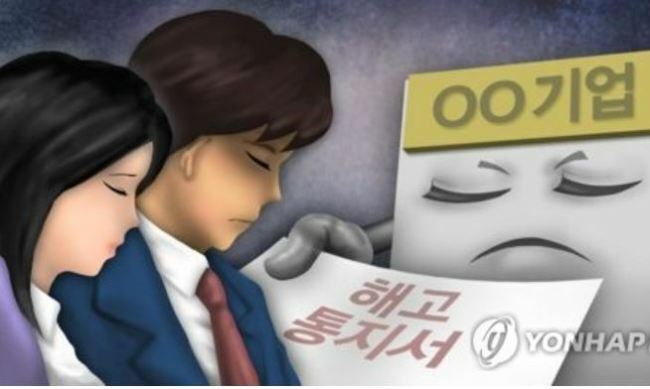 In the past, there were many workers in their 50s who readily accepted the management’s deal to accept 200 million won ($118,000) to 300 million won as compensation for leaving work early. And some of the retirees – after taking huge bonuses, were found to have simply relocated to rival companies or subcontractors. Some of them used their bonuses to start up their own small businesses. The current situation surrounding the voluntary redundancies has changed: The increase in bonus payments generally lags behind inflation, and while in the past it was workers in their 50s, now those in their early 40s have found themselves pressured to accept voluntary redundancy. 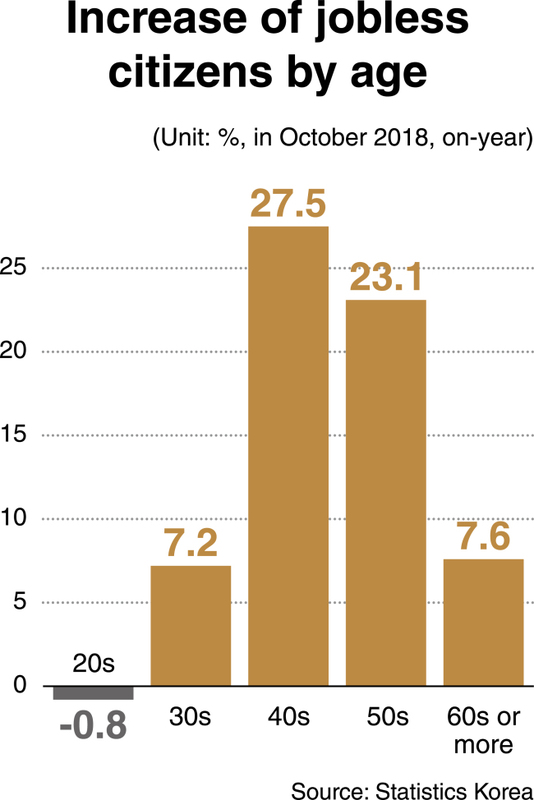 According to Statistics Korea, the number of unemployed people surged to 973,000 as of October 2018, the highest since Korea suffered in the aftermath of the Asian financial crisis 19 years ago. While the number of unemployed people increased by about 79,000 from a year earlier, those in their 40s saw the biggest on-year increase of 35,000, or 27.5 percent. Those in their 50s made up the the second-worst affected age-group with 30,000, or 23.1 percent. According to a research report from Shinhan Bank, a large portion of the households in their 40s underwent a rapid loss of income. Of those in their 40s suffering a loss of income, 38 percent of those surveyed picked retirement or layoffs as the main reason for their financial woes, followed by a pay-cut from the economic slowdown with 29 percent and small-business failure with 13 percent. The average reduction in income of the surveyed households headed by people in their 40s who had lost their jobs or who had spouses who had been laid off was 2.48 million won. More than a half of those middle-aged households, 55 percent, had failed to brace for their earnings’ decline in advance, according to the bank’s report. And middle age workers face more layoffs, as manpower restructuring via voluntary redundancy programs is actively underway in the conglomerate-based manufacturing and financial sector. LG Display has accepted applications for early redundancy, for the first time from assembly line workers, while its signature liquid crystal display segment has faced a tough challenge from Chinese manufacturers. A news provider claimed that about 2,000 employees had tendered applications to resign. Daewoo Shipbuilding & Marine Engineering is expected to cut its 9,900-strong workforce by about 900, as it had pledged to cut the payroll to 9,000. The company’s creditors are reportedly reviewing its restructuring scheme. In the financial sector, Hyundai Card is considering cutting its workforce by about 200 and shedding another 200 staff from its affiliates. The credit card issuer saw its consolidated net profit in the first half of 2018 drop 40.9 percent on-year from 130.8 billion won to 77.3 billion won. While some other credit card firms are poised to follow suit, banks such as Woori, Shinhan and Hana also issued voluntary redundancies over the past few months. Despite the news that more and more self-employed people are closing down their businesses, middle-aged people who lose their jobs have no choice but to tap the risky micro-business market, according to market insiders.